Jenkins Group Inc. is proud to announce the results of the third annual, 2010 Axiom Business Book Awards, designed to honor the year's best business books and their authors and publishers. Visit: http://www.independentpublisher.com for more information. "Read this groundbreaking book and you'll discover some simple truths about overcoming adversity. Part mediation, part how-to manual, Bright Triumphs illustrates through the prism of ten extraordinary individuals that confronting a hellhole is not the end of the world. According to Heenan, it could even be a required speed bump on the road to success–to, in the words, a Bright Triumph." 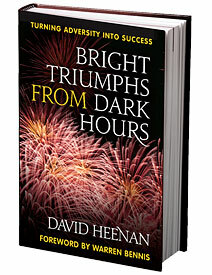 "David Heenan's fascinating stories of overcoming adversity make Bright Triumphs both a timely and inspiring read." "This is an inspiring book. All of us, if we honestly look into our hearts, we know that there have been moments when we have failed. Failed ourselves, failed our family and failed our communities. This book tells you that failure should not be the cause and reason for your demise." "Adversity can inspire greatness and this book shows you how. Get ready for an exciting read." "What does it take to effectively deal with adversity? Dave Heenan skillfully guides you through the lives of several extraordinary individuals and identifies the key approaches each used to master their extreme challenges. We all go through tough times and can use some wise advice on how to deal with them. Bright Triumphs provides it!" "Thought-provoking, inspiring, and useful insights for moving forward when problems seem intractable. Bright Triumphs made me want to get up and do something!"